Downtown Dwellers to raise money for Southbank mural - The Resident Community News Group, Inc. | The Resident Community News Group, Inc. Rendering of the mural that the Downtown Dwellers plan to have painted on the “Little Gray House” public restroom on the Southbank Riverwalk. The idea to spruce up the “Little Gray House” came when Peninsula residents Sandra Fradd and Susan Strauss took a stroll on the Southbank Riverwalk last spring. Since then the women, who are joined in their effort by Howard Taylor, who lives in The Strand, have interested the City’s Parks, Recreation and Community Services Department in renovating the public bathroom and have gained the City’s permission to hire a muralist to paint the gray exterior of the building. They are now embarking on a quest to raise $10,000 in January to pay to embellish the “Little Gray House” as well as other measures to beautify the Riverwalk on both sides of the river. “We said, this is an eyesore, but we could make it disappear if we could get a mural painted on it. It would be good if the mural would imitate the greenery that was nearby. What can we do to make this happen?” said Strauss. The “Little Gray House,” with thick foliage behind, sits in the shadow of The Strand and hides behind the Riverwalk’s famous Lone Sailor Statue. The thick underbrush in back of it was known to be a haven for homeless, and its public restrooms were not often used by the faint of heart. “Unless you knew it was there, it looked like a little dilapidated building left over from some other era,” said Taylor. 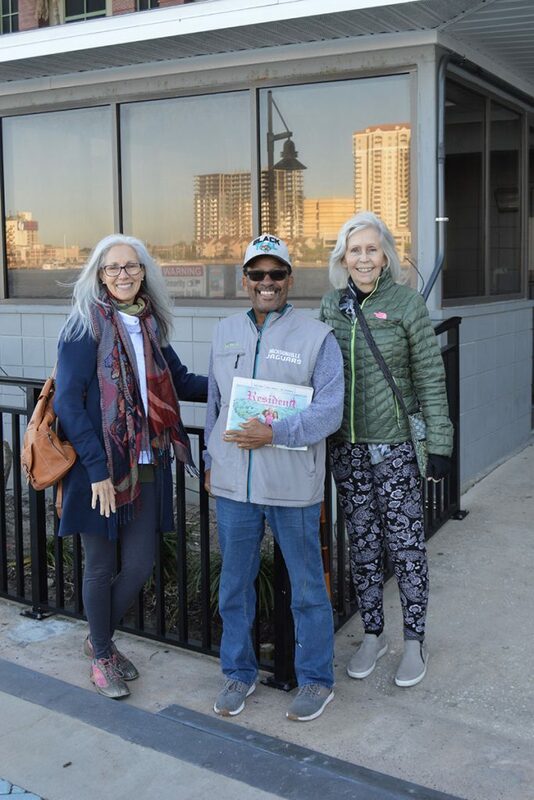 Susan Strauss, Howard Taylor and Sandra Fradd, members of the Downtown Dwellers, are working on raising funds for a spruce-up of a public restroom known as the “Little Gray House” on the Southbank Riverwalk. To see what could be done, the trio first consulted with The Downtown Dwellers board and then embarked into conversations with District 5 Councilwoman Lori Boyer, who represents the Southbank, Daryl Joseph, director of the City Parks, Recreation and Community Services Department, and Jill Enz, a landscape architect, who works in the Parks Department under Joseph. “Based on all our conversations, the Parks Department has decided to renovate the building,” said Fradd, adding that the City has since pruned back the shrubbery and overgrowth behind the building leaving only the trees. After gaining permission first from the City and then the Dweller’s board on Nov. 15, The Downtown Dwellers group rejected the idea of a Kickstarter campaign, preferring instead to raise funds for the mural in a way that would build a better sense of community. Strauss agreed. “Also, in addition to what Lori’s doing, our interest is in fostering a real neighborhood, which means residents and real business entities of whatever sort that might be here, and right now, it’s a very limited sort on both sides of the river,” she said. “Our project will blend in with Lori’s, especially her plans for pocket parks and nodes,” said Taylor. The Downtown Dwellers plan to fundraise throughout the month of January and have Naskashi paint the mural in February, with a celebration afterwards. The City, which recognizes The Downtown Dweller’s efforts as an in-kind donation of $10,000 to the Parks Department, has agreed to install lights to illuminate the mural at night, and the Dwellers have agreed they will pay for maintenance of the mural including, if necessary, graffiti removal and having the artist touch up the painting in the future if the colors fade a bit, Fradd said. “The lights will limit any interest the homeless or others might have in doing some damage,” she said. So far, the Dwellers have received several private contributions and are now going about to secure the “second half” of the money needed to finish the project. They also intend to use money raised from their January campaign on an undecided art project for the Northbank Riverwalk. As a 501(c)(3) organization, The Downtown Dwellers ask that tax deductible donations be made on their website – TheDowntownDwellers.com – via PayPal. They also plan to spread the word of their campaign through other neighborhood organizations such as the San Marco Preservation Society, Riverside Avondale Preservation, St. Nicholas Area Preservation and the Springfield Preservation and Revitalization Society. As far as fundraisers go, the Dwellers are planning a “Tumble-Down” event for 40 or 50 people on the 38th floor of The Peninsula to watch the detonation of the Courthouse Annex when it occurs. The view of the Courthouse Annex from the top of The Peninsula is excellent and all money raised will go toward the beautification efforts, Fradd said. “The Little Gray House is the only public restroom on the Southbank. What we are doing is a public service to the whole city. More than anything we want to let people know what we are doing as a group and invite them to support us and collaborate with us,” said Fradd.